Today is all about transit of the suez canal. There is so much I could write I will have to limit this blog to bullet points which may inform you but will remind me of some of the many facts that I have learned and noticed along this canal journey. Firstly I had to pinch myself as I sat eating my breakfast whilst sailing along the suez canal I don't suppose I will be able to say that agin in in my lifetime or at least very often. My first impression is of what an engineering achievement it is to build something so long, wide and deep in the middle of what is a very flat and sandy desert. Secondly this seems to be built through the middle of the worlds biggest military camp. Both sides of the canal have military bases every km. I know Sinai is strategically very important but both sides are in fact in Egypt. There are not only lookout posts but on the Sinai side there are soldiers standing on top of sand dunes, most bizarre. Several of the camps appear to have resident camels and many of them have groups of dogs patrolling the sand alongside the soldiers but not together the dogs appear to be patrolling on their own! Then there is the contrast between the east and west Shores. The west is relatively green there are trees and crops growing and plenty of signs of life. 200m on the other side of the canal you would think that they were enemies. On the east side there is no sign of significant building at all apart from military bases. The east is totally dry no irrigation no trees no crops nothing. Just barren sandscape. Other little things I have learned are 1. The statue of liberty was built to stand at the mouth of the suez in port Said but due to financial problems associated with the construction project it was decided it was not appropriate to place a celebration at the beginning of the canal, so instead it was given as a gift to the USA. The canal was initially a collaboration between the French and the Egyptians. The French providing the engineering skills and the Egyptians the labour. Invariably it was only 20 feet wide and 6 feet deep then it was widened and deepened when flooded as dredging is much easier than dry digging. The Egyptians eventually were so hard up they sold their half of the canal to the British (Disraeli). Later the UN took the canal back and gave it to the Egyptians embarrassing the Israelis, French and British. On both sides of the canal there are very large war memorials not sure for which war one was Italian for 1914-1918 war. The ships entered the canal in convey we were 6 of 39 and each ship is 2 miles from the next one, they all have Egyptian pilots on board. towards the centre of the canal there is a large lake this is where the ships from the other direction wait and pass each other so when you get there there are about 70 or 80 ships all amassed quite a sight. Also the local ferries seem to nip between the passing ships in some cleaver choreography. Along the west shore we passed the very grand palace of ex president Mubarak. Egypt are currently awaiting elections in may for their first elected leader for many years. There is a Japanese funded peace bridge at a large town not sure what it is called. The ship passed within 5 m of the road above so was quite a sight. 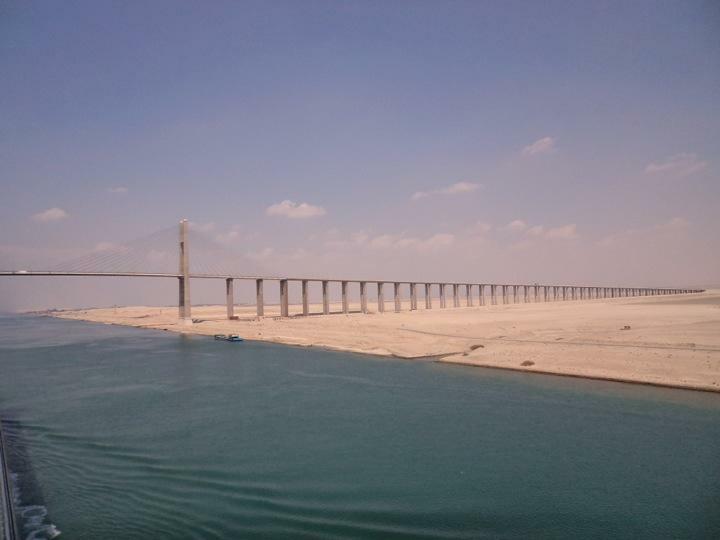 The Japanese funded the bridge to help Egypt have access to the mineral rich Sinai peninsular, which I suspect the Japanese also had an eye on. Then there is the temperature, as we move from the Red sea to the med it is as if the heater has been turned off. Firstly we ran into another sandstorm when we went into it it was sunny and about 27 degrees, when we came out the other side it was cloudy wet and about 18 degrees, cooler I believe than home! We visited port said later in the day for a couple of hours and whilst we didn't see too much at least we can say we visited Africa . The salesmen there were as pestering as you might have expected, their products were more shoddy than most other places that we had been but the good news is that they all loved Wendy I lost count of the men who told her she was a beautiful woman and also they told me I was very lucky. Not shy these Egyptians of course Wendy. Was loving it, until I offered her up for sale!.!.!.!.!.!. Valda & Michael Great to read your blog. Bridge, had to happen eventually! Enjoy the rest of your holidays. Say hi to Barbra & Frank. We are driving home after s w/e in Bribane. Only 7 more hours. Keep in touch.